NVIDIA Tegra 4 is just a few days away from making its debut in the consumer market, as the NVIDIA SHIELD is expected to ship this month. 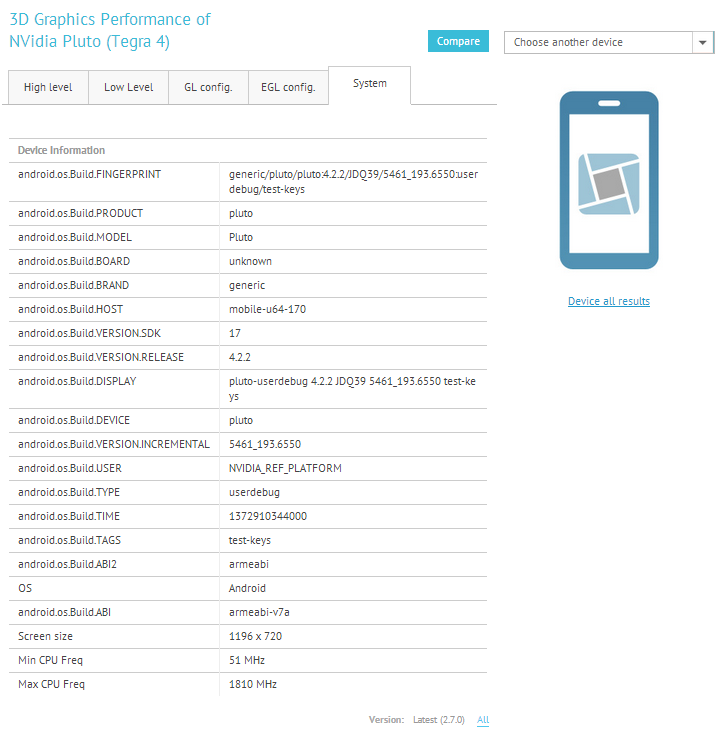 And just in time for Tegra 4's launch, GFXBench results of the Tegra 4 appeared on their database. The results in question are of a device named "NVIDIA Pluto" running on a 1.8GHz Tegra 4. The results are impressive, and some of the results even beat the iPad 4's monster GPU. The device named Pluto runs on Android 4.2.2, the 1.8GHz Tegra 4 SoC powers a 1280 x 720 display. However, GFXBench reports a very unusual display resolution of 1196 x 720. Don't take the Onscreen tests very seriously, as the Pluto device gets a huge resolution advantage over the iPad 4 (1280 x 720 vs 2048 x 1536). Now, considering the Offscreen tests, Pluto appears to have a slightly better result than the iPad 4 in the T-Rex HD test, however, the iPad 4 performs a bit better than the Tegra 4 in the Egypt HD test. 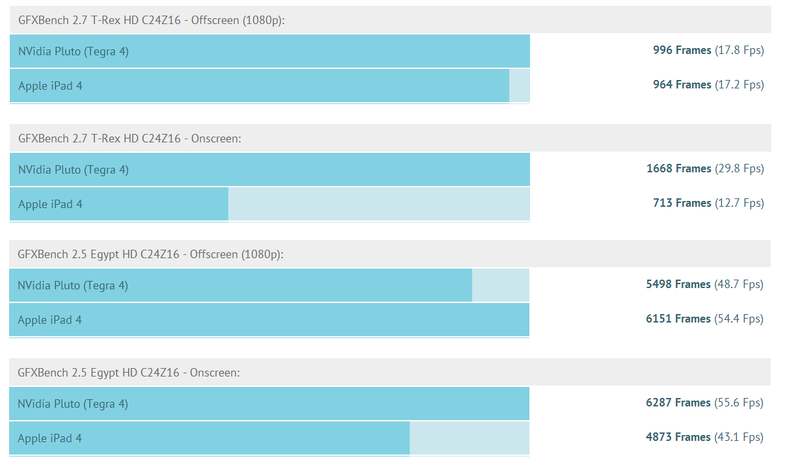 There's not much data to get on with here, but you can get an idea where the Tegra 4 is in relation to the competition. As in GFXBench Pluto performs significantly better than the Nexus 10's Mali-T604 and also outperforms any current Areno 320 device, it's safe to say Tegra 4 is the best SoC in Android territory and is even on par with the aggressively specced iPad 4. Well done NVIDIA, but I'm afraid their Android supremacy will be short-lived, as the Qualcomm Snapdragon 800 SoC is also close to its debut, and its Adreno 330 GPU will almost certainly blow the Tegra 4 and even the iPad 4 out of the water. As for what is the Pluto device, I did some digging and found that NVIDIA Pluto, along with a Windows 8-running "Covington" that I wrote about a few months ago, is a development board for Tegra 4, possibly a DevKit. Based on the benchmarks I've seen so far, the Tegra 4 is bound to be an impressive SoC, as it will offer 2x-3x the CPU performance of the latest iPad (the CPU will actually be one of the best mobile CPUs), lots of memory bandwidth and a GPU better than anything else on Android, that is on par with the iPad 4, all in a small ~80mm2 die; much smaller than the iPad 4's massive 123mm2 SoC.